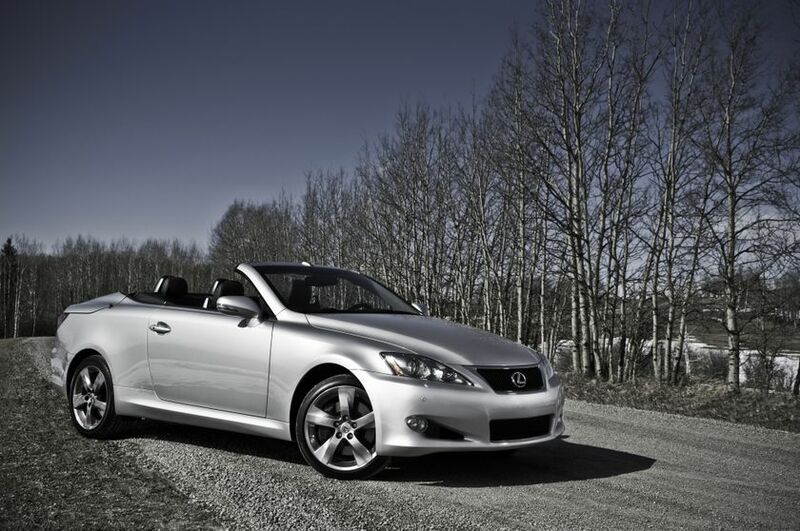 (TORONTO) – Canadians who know that perfect summer days are few can pursue more perfect moments in the open air in the all-new, 2010 Lexus ISC luxury hardtop convertible coupe. Built upon the proven platform of the popular Lexus ISseries luxury sport sedans, and engineered for no-compromise quiet and comfort, the Lexus IS250C and Lexus IS350C deliver top-down driving pleasure in good weather plus the comfort of a seamlessly-designed hardtop roof when things turn stormy. Lexus introduced the IS sedan almost a decade ago, and it continues to deliver adrenaline-fueled moments of pure driving pleasure. Last year, the IS F joined the series as “the Beast” that delivers raw track-proven power and performance. Now, the all-new 2010 Lexus IS 350C and IS 250C hard-top convertibles give Lexus a coupe and convertible in the entry luxury segment for the first time. The IS series has become the perfect trilogy of fun, performance and freedom. Featuring a convenient single-switch operation, the new three-piece hardtop provides open-air freedom with the top down without sacrificing the quiet and comfort of a coupe. Constructed primarily of lightweight aluminum, the hard top also provides surprising storage space but with low noise and increased security not typically found in soft-top convertibles. In addition, the top completely retracts with no elements remaining in view. “The ISC provides additional moments to inspire and delight our guests. These include the fastest retractable hardtop in its class – converting the ISC from an all-weather performer to an open air cruiser in just 20 seconds – plus many other features that redefine open top motoring comfort in a coupe,” Mr. Hutchinson continued. The 2010 Lexus IS250C and Lexus IS350C are arriving at Lexus showrooms across Canada now. Pricing for the IS 250C starts at an MSRP of $52,100, while the IS 350C starts at an MSRP of $60,400. A roof-speed brake-control system decreases the roof speed especially as it approaches the end of the closing operation in either direction, ensuring an elegant and quiet movement. Standard Intuitive Park Assist (IPA) will stop the movement of the luggage door at the start of operation if it detects an obstacle will interfere. Also, a visual warning will appear on the instrument panel if a detected obstacle may soon interfere with top operation. When the IS convertible’s top is opened or closed, the power windows will automatically lower if in the closed position, and raise back up when the operating switch is held. Also, when the top is up, the door windows automatically lower 15 mm when the door opens, and then raise back into a fully closed position when the door closes. This ensures the doors’ clean open/close function while also maintaining a tight seal around the glass. The aluminum hard top features an automatic front lock assembly that provides the interior security not found in soft-top convertibles. When the top is stowed in the down position in the rear of the IS convertible, the lock assembly is engaged to keep the panel in a fixed, stable position. The IS convertible features 18-inch wheels which have an athletic five-spoke design with asymmetrical changes in shape and a liquid-graphite finish. They feature the tire-pressure warning system found on the sedan models. In addition to standard all-season tires, an optional run-flat tire is available either with or without a spare, adding to the available luggage space. Five colours common with the IS sedan are available on the convertible, including ultrasonic blue which is shared with the ISF. Like the sedans, additional wet sanding is applied in mid-coat application to provide a premium finish. The interior adopts recycled materials in 13 various areas including door and side trim. The IS convertible will have three interior trim color options, including two new colour combinations. In addition to black leather interior, a new alabaster color is joined by a distinctive alabaster/blue contrast trim. The IS convertible models feature the same powertrains as the IS sedans. The IS 350C's 3.5-litre V6 delivers exhilarating performance with outstanding 306 horsepower at 6,400 RPM along with 277 lb.-ft. of torque at 4,800 rpm. The IS 250C's 2.5-liter V6 engine has a great combination of fuel efficiency and performance. The IS 250C’s V6 produces 204 horsepower at 6,400 RPM and 185 lb.-ft. of peak torque at 4,800 rpm. Both engines utilize aluminum cylinder blocks and heads, while employing dual Variable Valve Timing with intelligence (VVT-i), which controls timing on both the intake and exhaust camshafts. The new IS convertible emphasizes easy access and rear-seat comfort. In addition to front doors that are 11.8 inches longer than the IS sedans, two convenient fold-forward lock-release levers are standard on both sides of the front passenger seats, making it easier to operate from any location inside the vehicle. In addition, the passenger seat features a power slide button on the top of the seatback to ease rear seat ingress/egress. A standard new automatic one-touch, easy-entry power-seat mechanism provides even easier egress and ingress through quick-acting, front-seat fold-and-slide activation. The two passenger doors also have three open-stopping positions (rather than the normal two) to add convenience in various parking situations with different spacing between vehicles. The IS C also is equipped with a standard power tilt and telescoping steering column to help the driver quickly get into a comfortable position. Standard Intuitive Park Assist (IPA) system uses ultrasonic sensors to detect objects close to the car's front and rear bumpers, alerting the driver and showing distance to objects in the multi-information display within the speedometer. When any IS model is also equipped with the optional navigation system, information on objects detected in the rear are shown in greater detail on that system's seven-inch display via the backup camera. The standard Lexus Premium Audio System features a six-disc, in-dash CD changer, and eight speakers. An equalizer system maintains the same acoustic field when the top is either open or closed, compensating for the natural loss of bass sounds when open. In addition to the 1/8th-inch audio mini jack on the IS sedan, the IS convertible will also have a standard USB connector in the centre console for interface with an iPod that will not only play the music on the device, it will display information on the navigation screen such as artist, album and song track. Bluetooth Audio wireless connectivity is another new feature available for those customers with compatible devices. Standard XM satellite radio (subscription required) offers a wide variety of programming, while standard hands-free voice recognition and Bluetooth technology for models without optional navigation allow phone calls to be made and received while driving. Lexus’ latest Hard-Disk Drive (HDD) navigation system, with a new set-up display and increased audio-display tabs, is available on the IS convertible and is complete with a seven-inch VGA touch-screen and back-up camera.. The navigation system also includes as standard on all navigation-equipped IS convertibles Lexus’ latest voice recognition system, Voice Command, which builds upon the previous-generation system’s functionality, adding more spoken-command flexibility. With Voice Command users avoid having to speak commands in a specific order (e.g., “Phone > Dial by Name > Dial Bob”). Now this same task can be completed simply by saying, “Call Bob at home.” The Voice Command system also works to control many functions of the audio system, heating and air conditioning, and the navigation system. Commands such as, “Make it cooler,” “Let’s find XM channel 46,” “Show me Japanese restaurants,” and “I need a gas station,” make tasks easier to accomplish, in fewer steps, and help allow drivers to focus more on the road ahead. A Mark Levinson Premium Surround Sound Audio system, exclusive to Lexus is available in conjunction with the optional navigation system. This 12-speaker audio system features discrete 5.1 multi-channel playback with 5.1-channel speaker architecture. Its 10 amplifier channels provide 270 watts total output at 0.1 percent total harmonic distortion (THD). From 20-20,000hz, the Mark Levinson system plays conventional CDs and specially encoded DVD audio and DVD video discs, plus MP3/WMA-formatted CD-R/RW and DVD-R/RW. DVD movies can be viewed on the optional navigation system's seven-inch colour touch screen when the parking brake is engaged. The standard High Intensity Discharge (HID) headlamps paired with the Adaptive Front-lighting System (AFS) helps to illuminate a curve as the driver steers into it. The standard SmartAccess keyless entry and push-button-start/stop allows the driver to keep the access key FOB in a pocket or purse. The standard HomeLink programmable garage door opener also operates home security devices and other systems. The IS C F-Sport Performance Accessories will include performance enhancing parts such as 19-inch forged alloy wheels, brake upgrades, suspension systems, air intake, exhaust systems and more. F-Sport Performance Accessories by Lexus USA are engineered by Toyota Racing Development (TRD). When installed by an authorized dealer, the accessories are fully warranted for 12 months or for the balance of the new car warranty, whichever is greater. Parts for the IS C will be on sale upon the IS C’s launch. Buyers of any 2010 IS 250C or IS 350C should enjoy the peace of mind that comes with the industry-leading Lexus comprehensive warranty that covers the entire vehicle for four years/80,000 kilometres. Power train components are covered for six years/110,000 kilometres, major emission control components are covered for eight years/130,000 kilometres and corrosion perforation for six years with unlimited distance. Service adjustments - minor repairs not usually associated with the replacement of parts - are fully covered for one year/32,000 kilometres, while Lexus owners also enjoy the Tire Road Hazard Protection warranty and access to alternate transportation.